In 1907, Kentucky’s first modern skyscraper was built at 638 Madison Ave. to house Coppin’s department store. In 1990, it became Covington’s City Hall. 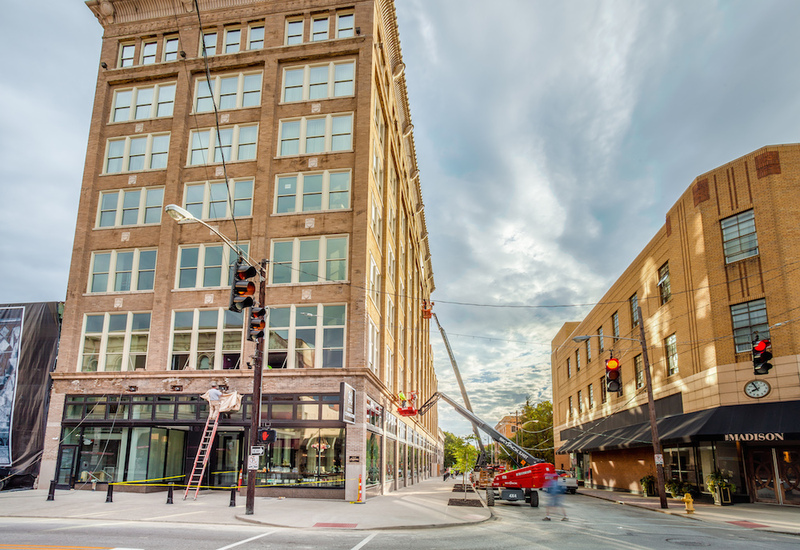 And as of September 2016, it’s a brand new 114-room boutique hotel, thanks to a partnership between the Salyers Group (locally) and Aparium Hotel Group (in Chicago)—with an investment to the tune of $22 million. If one thing’s clear, it’s that “buy local” was marching orders, not empty maxim, for design, architecture, branding, food—even the linens. 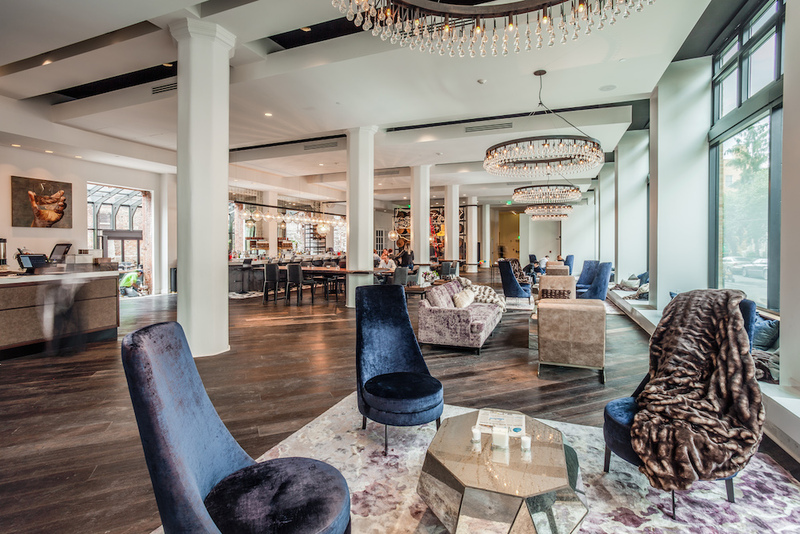 Scroll down to take a look, and we’ll meet you in the lobby bar. 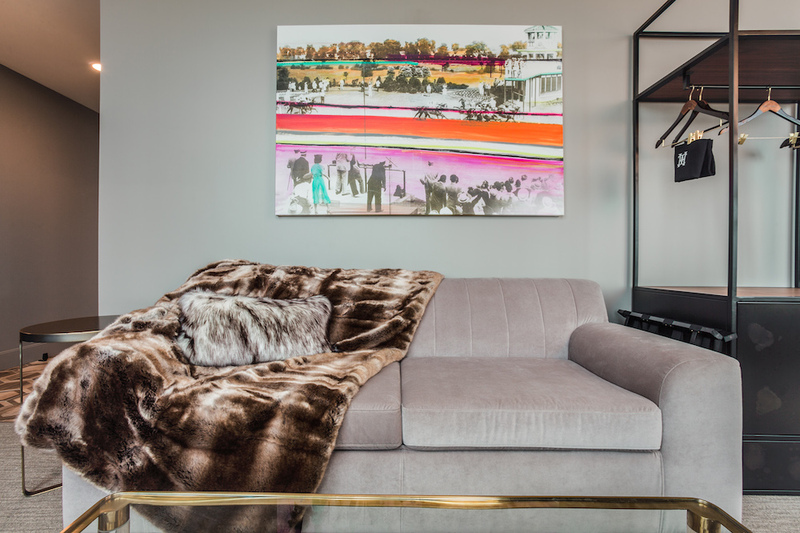 All art in the rooms comes from local artists. 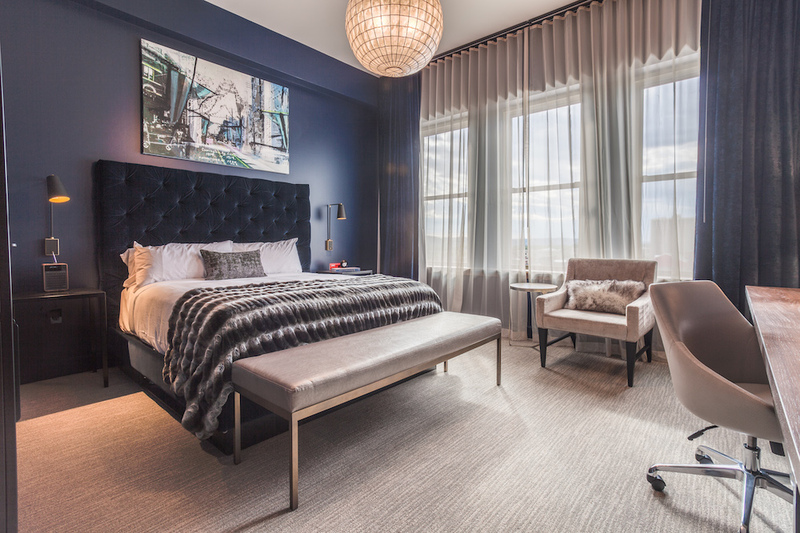 Twenty percent of the rooms are painted aubergine, navy, or black—colors that historically signified wealth in Covington. Local art extends into the bathrooms, too. 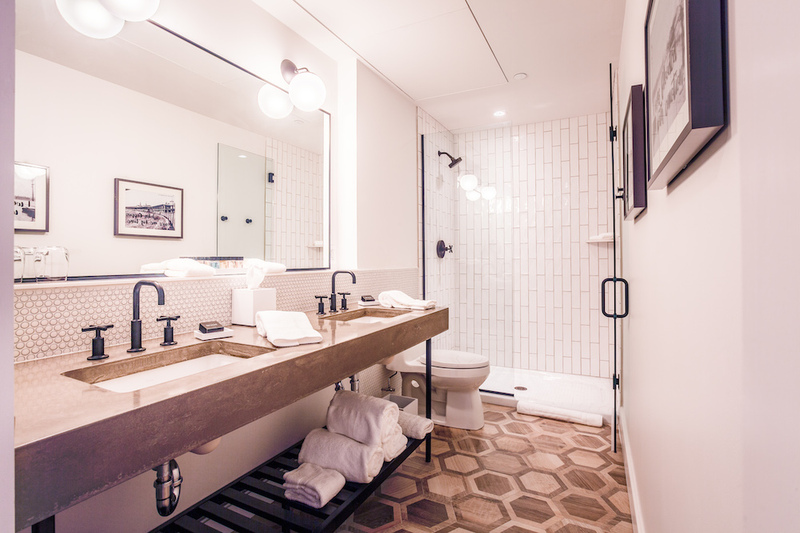 Bathrooms that alone would sell us on staying here. 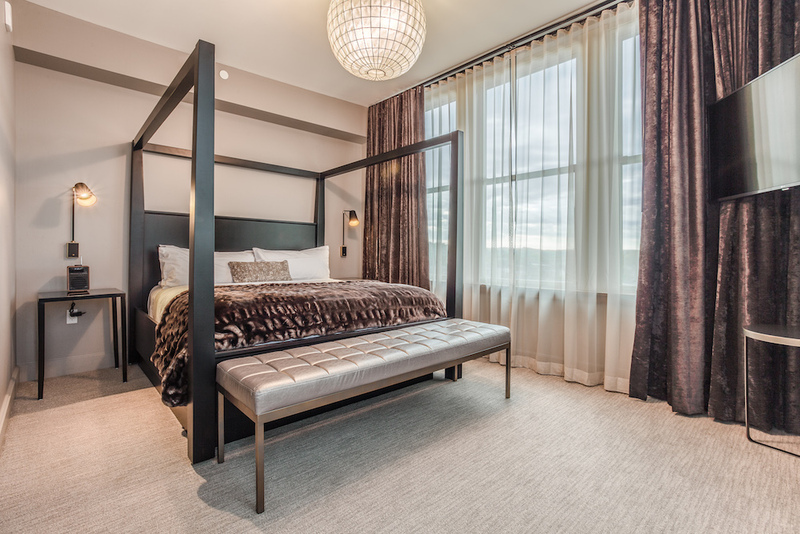 Donna Salyers’ Fabulous-Furs adorn the all-custom fixtures and furniture in every room. 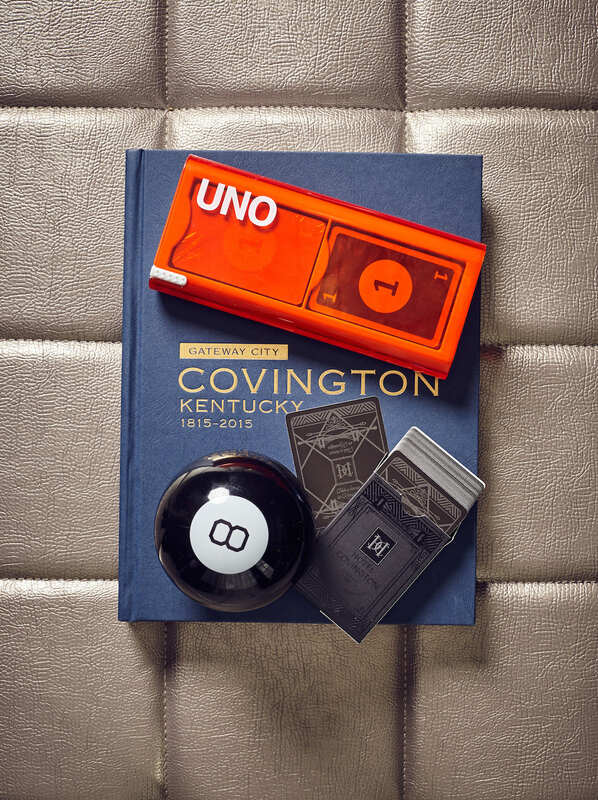 For analog entertainment: Uno (invented and made in Cincinnati), a Magic 8 Ball (allegedly first created by a Cincinnati man), and a custom deck from the United States Playing Card Company in Erlanger. 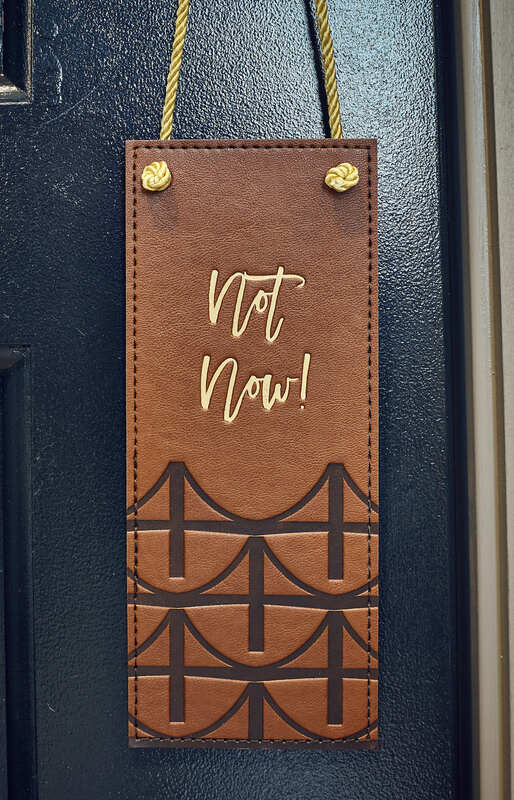 Local designer Gina Tesnar of Reign Studio led the brand design for the hotel, part of which included creating several patterns you’ll see throughout the hotel—like this one inspired by the Roebling bridge. 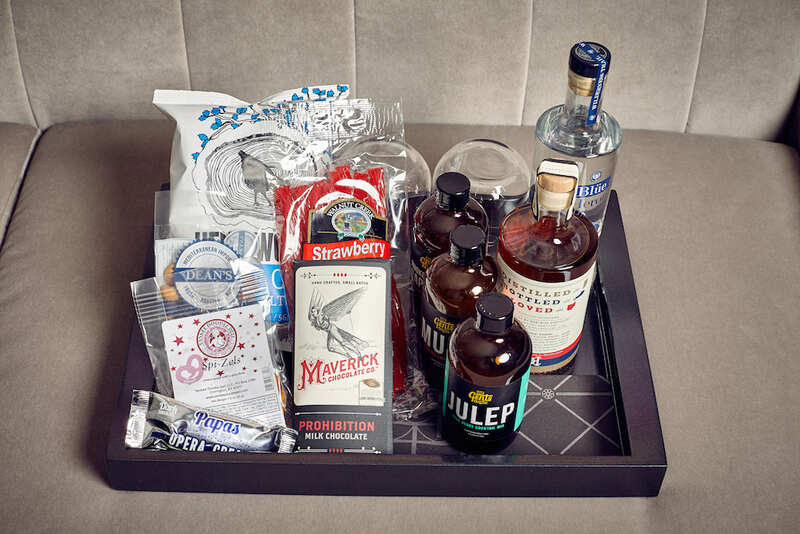 The mini bar situation looks seriously good: Maverick chocolate; Dean’s Mediterranean nuts; Braxton, MadTree, and Rhinegeist beer; New Riff bourbon; Gents cocktail mixers; Hen of the Woods chips; Papas Opera Creams; and more. 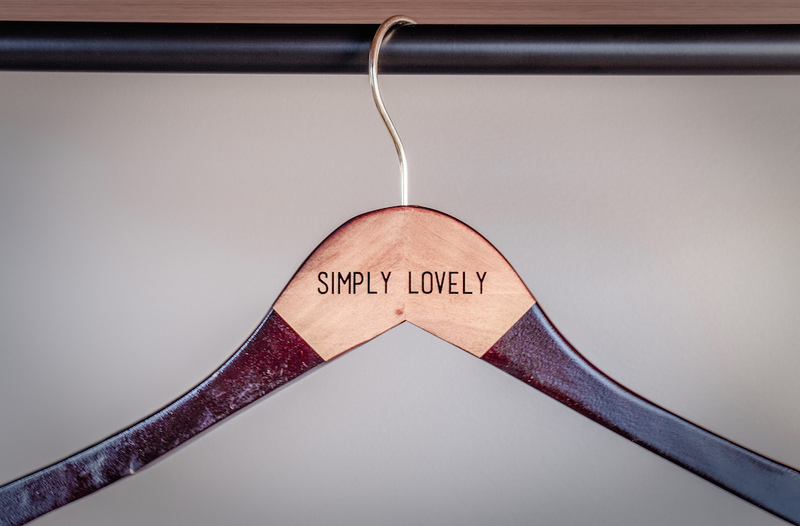 Lucca Laser Workshop added their touch to the hangers. And after the party it’s the hotel lobby. No Folgers in these parts. 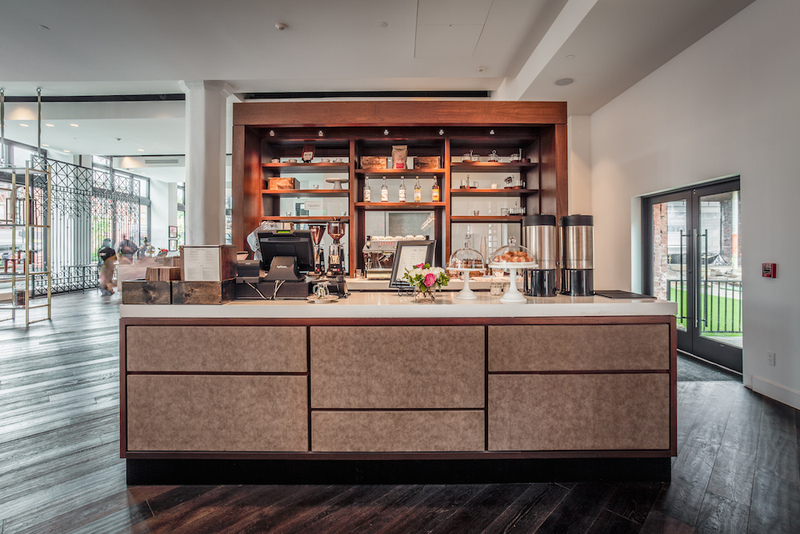 You’ll be drinking Carabello Coffee (the roastery also gave barista training to those who will staff the lobby stand). 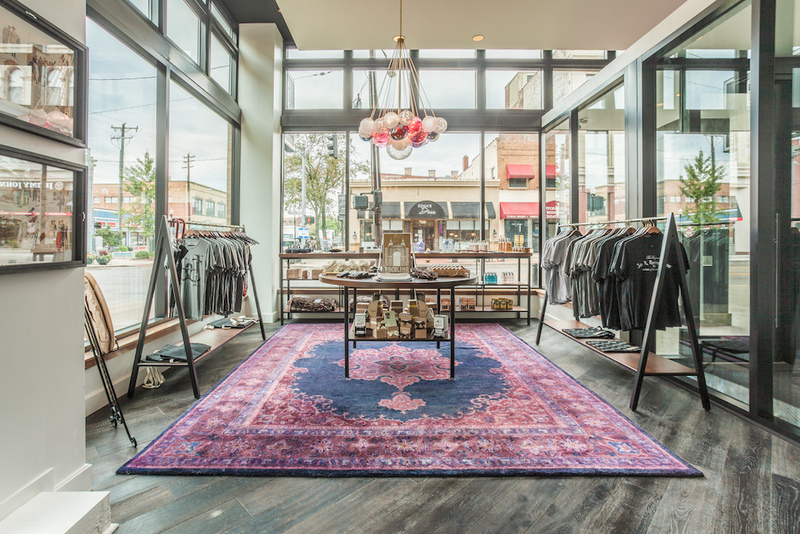 The first-floor shop is stocked with goods from local makers. 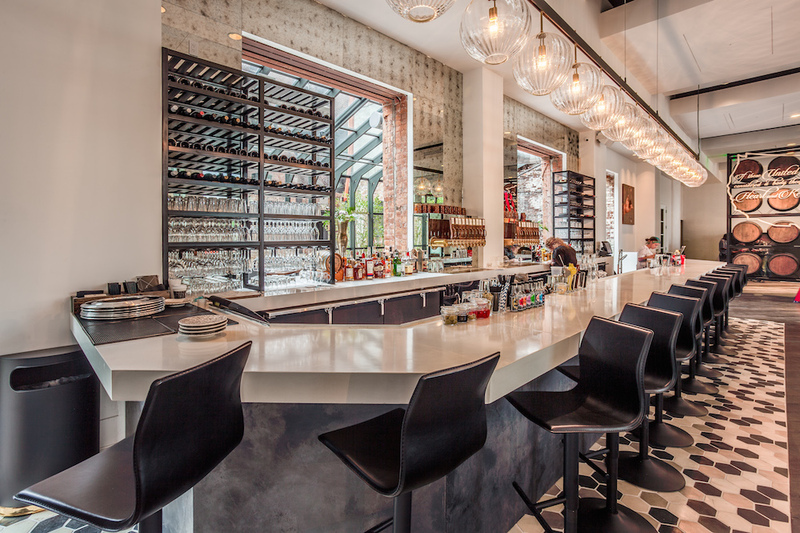 The lobby bar, which utilizes salvaged materials found in the building. 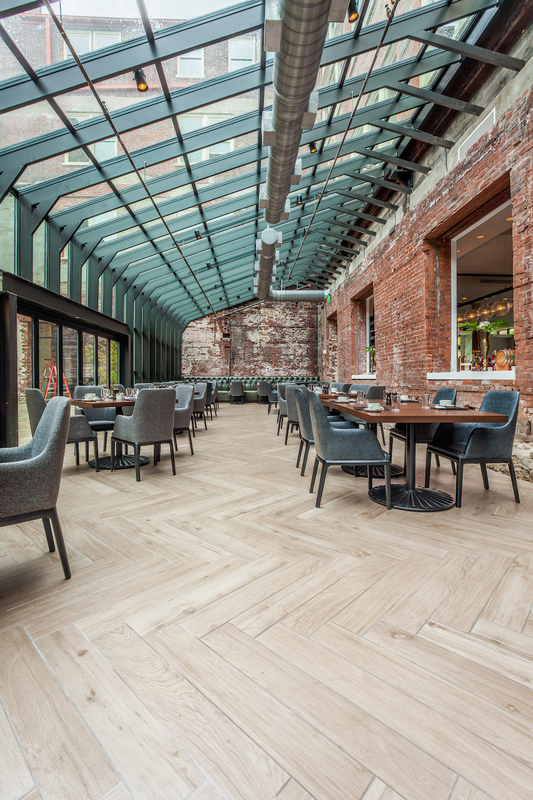 The main dining room of Coppin’s, the hotel restaurant (named for the original department store) that serves up seasonally driven American fare, much of it locally sourced. Tall ceilings: Check. Original ten-inch concrete floors so you’ll never hear noise from upstairs: Check. Custom alarm clocks, even: Check. The hotel exterior getting final touches in late September.